Located at the center of Kagoshima bay in south Kyushu, Sakurajima is a volcanic island appeared on the southern rim of Aira caldera. It is a composite volcano with the summit split into 3 peaks, Kitadake (northern peak), Nakadake (central peak) and Minamidake (southern peak) which is active now. The surface of the island is about 77 km2. The western part belongs to Kagoshima city and the east to Sakauajima town. A road turns around the island through a desolate lava plain. Belonging to Kirishima Yaku national park, you can reach from Kagoshima harbor in 10 minutes with a ferry. Always fuming Sakurajima is situated on the opposite shore of Kagoshima city and one of the most active volcanoes in Japan. The currently active Minamidake peak (1040m) is a strato volcano appeared on the mountain hill of Kitadake peak. During the great explosion of the3th year of Taisho era, it spouted 300 million tons of lava and has become attached to Osumi peninsula. The current form of explosions consists to spout rocks, ashes and gas from a crater on the top. Located on the western shore of Kagoshima bay, the prefectural office is settled there. It has developed as a castle town of Shimazu clan who was controlling south Kyushu. 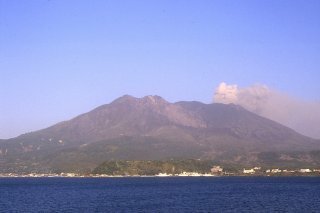 Because of the vicinity to an active volcano, Sakurajima, the town is frequently compared to Naples. Other tourist spots are the remaining of Kagoshima castle (Shiro Yama) and the private garden of seigniors (Iso Teien). It is also a starting point to island group (Nansei shoto) such as Yaku and Okinawa islands. The population is about 540,000. Located in south Kyushu between Satsuma peninsula and Osumi peninsula, Kagoshima bay has originated from 2 volcanic explosions which formed Aira caldera in the north and Ibusuki caldera in the south. The north-south length is about 70 km while the west-east width, 20km. Sakurajima is inside the bay. The waters is generally profound and owns many good harbors such as Kogoshima, Ibusuki and Tarumizu. A part of the coasts belongs to Kirishima Yaku national park.